This ranch is a complete package! Majestic views of the Double Mountains to the south and a deep canyons on the north. Everything in the middle is great habitat for wildlife! The ranch is complete with lodging ad hunting equipment. Call today for a private showing! Location:	Located on County Road 410, about 14 miles West of Aspermont, 65 miles Northwest of Abilene or 185 miles Northwest of Ft. Worth. Acreage:	330+/- acres. 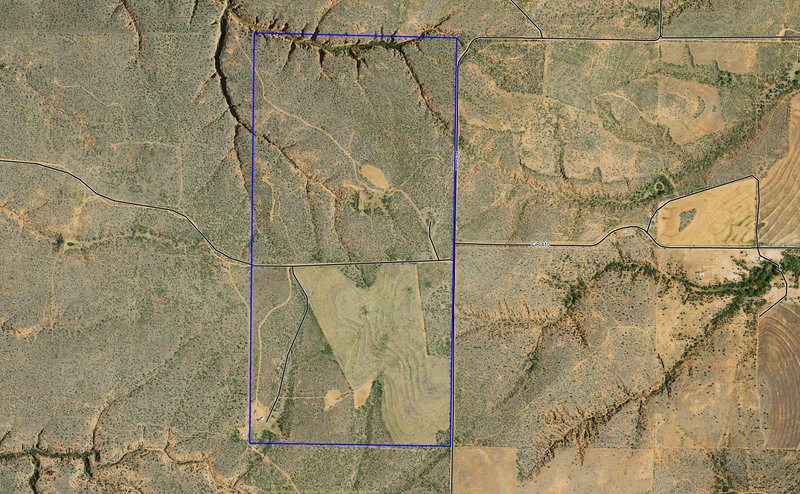 The Matzinger ranch is extremely diverse, consisting of rolling grassland, mesquite flats, several draws and canyons. Cover includes Mesquite, Hackberry, Chinaberry and a few Cedars. Improvements:	There is a 16 X 76 mobile home in the southwest corner of the property that will come furnished and ready to use. The Seller constructed a 20’ X 26’ barn for storage near the house, and there is a shipping container as well. Utilities:	Electricity is in place at the house and is installed for several RV hookups. The water well is piped to the house and RV hookups as well. Topography:	The ranch is rolling on the south end and turns into canyon country on the north. The canyon on the north boundary line will take your breath away! Overall, this property gives some of the best hunting habitat in the area. Water:	Water is provided by a water well located at the southwest corner of the property. in place. At the time of this writing, all but one of the tanks are holding water. Two of the water wells supply water to troughs that overflow into small ponds that have been made specifically to enhance wildlife water. Hunting:	This area offers excellent hunting of Whitetail Deer, Rio Grande Turkey, Bobwhite Quail, Mourning and White-wing Dove and Feral Hogs. The mixture of heavy cover, draws and pasture, and rolling grassland really enhances the wildlife habitat on the ranch. Minerals:	Seller will convey any minerals owned under this property with an acceptable contract. THE INFORMATION CONTAINED HEREIN IS BELIEVED TO BE TRUE AND CORRECT. HOWEVER, EKDAHL REAL ESTATE DOES NOT GIVE ANY WARRANTY FOR ITS ACCURACY. PLEASE BE ADVISED THAT THIS REAL ESTATE AGENCY REPRESENTS THE SELLER. Buyer's Agent must be identified on first contact & must accompany buying prospect on all showings to be allowed full participation. If this condition is not met, fee participation will be at the sole discretion of Ekdahl Real Estate. No trespassing. Seller's agent must be present for showings.